Did you get a Souvenir? 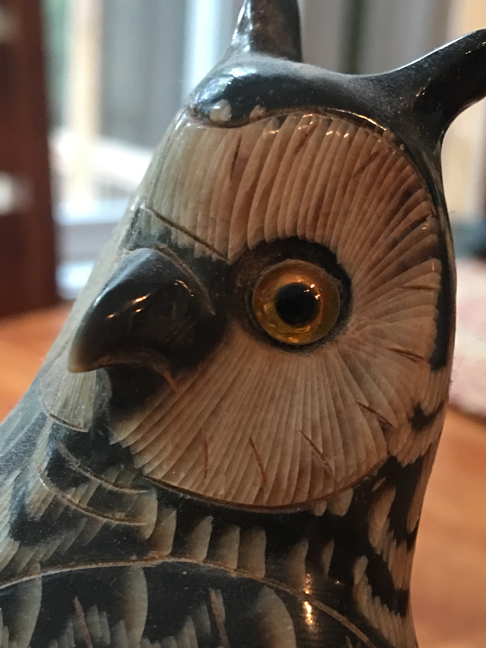 Souvenir is a French word from the 12th century meaning “to remember or to come to mind.” Looking at the history of the word means we have been transplanting oddities from country to country since the 1100’s. If you do the math, that’s 900 years of pocketing trinkets in one place and moving them to another. I wonder which country has the most items removed from it? I would venture to say Egypt and all the treasures from the pyramids or perhaps it’s Greece and all of the beautiful statues and pottery long gone. I admit that I have brought home my fair share of souvenirs. I buy them from stores, keep printed napkins from restaurants, or sometimes I just pick up pretty rocks or tiny pinecones. You name it, I probably have it. One of the funniest souvenirs I ever bought was this pillow cover. I now have it on my wall and do not use it as a pillow cover. 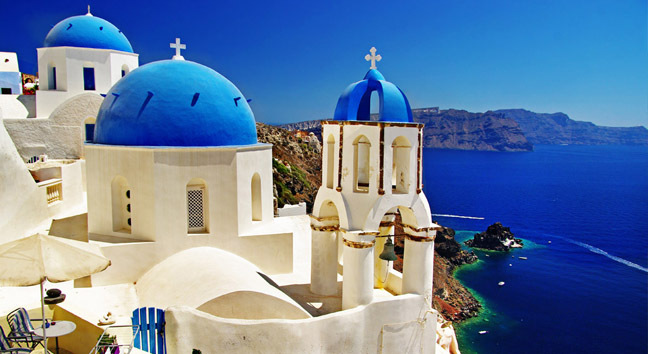 We were on a trip to Greece and the tour guide stopped our bus at prearranged stores where he could get the most kickback from our spent travel dollars. A small, dimly lit store was one of our first opportunities to get off the bus, stretch our legs, and drop some cash. An older Greek gentleman came out and in broken English explained that his mother lovingly made these pillow covers in the back of the store. He kept saying “Mama make, Mama make.” He described how she threaded her needles and gestured how she sewed each and every one. 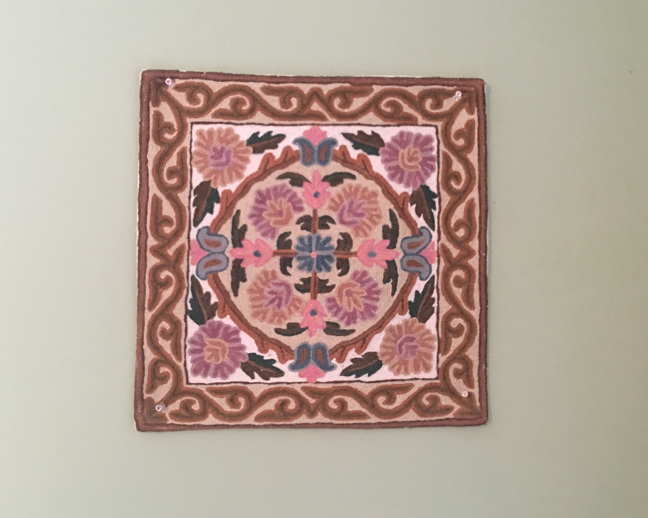 We all dutifully bought these painstakingly-made souvenirs of authentic Greek handicraft only to find them in about EVERY store thereafter. His 90-year-old Mama must have been VERY busy to supply all of Greece like that. We couldn’t help but laugh at being gullible tourists. One summer on a trip to Ohio we made a northern detour to Canada to see Niagara Falls. I hadn’t been since my high school days and I wanted my kiddos to be exposed to those negative ions provided by the crashing waters of the falls. I figured they might argue less and become happy zombie children for the car ride home if they could experience the rejuvenating miracles of rushing waters. Well, the crashing waters didn’t work as anticipated and so I thought maybe if I could bribe them with souvenirs, they might be happy on the 945 mile car ride home. We went into a Made in Canada store. Amongst the vats of maple syrup, shelves of maple syrup candy, and rows of cookbooks of maple syrup recipes, I found this beauty. Or at least I thought it was beautiful at the time. Maybe it was the euphoria from all the negative ions, but believe it or not I was willing to pay $42.99 Canadian dollars for it 10 years ago. That’s about a million dollars in U.S. 2017 money. 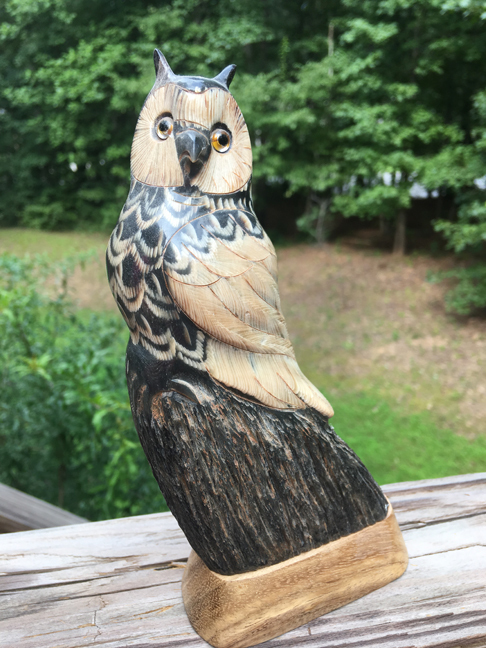 It’s a disapproving owl carved out of a horn. Yet here it stands in my family room near the Mama Make pillow. I’m gathering quite a shrine. 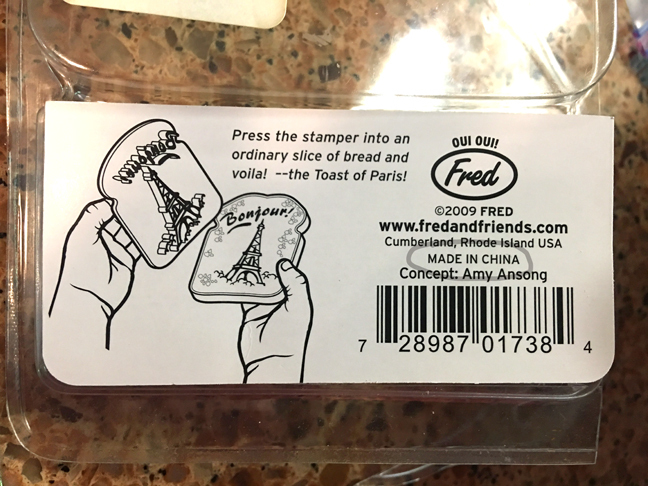 This last souvenir is actually a memento of Paris I bought here in the United States. I love toast, especially with jam and butter. 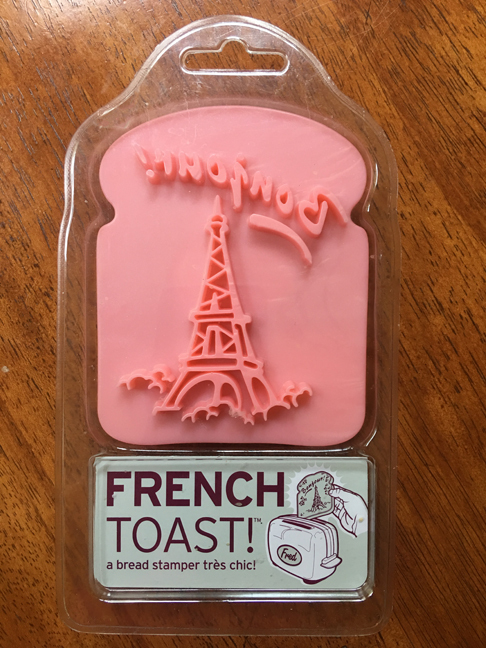 When I saw this clever “French Toast” bread stamper, I knew I had to have it. It was only $3.00 and I adore a good pun. Today, for the first time, I shall try the press. I couldn’t find any white bread in our freezer so I had to go with whole wheat. Not sure about that. Here is my bread after my first toasting. You can faintly see an indent so maybe I should toast it again. 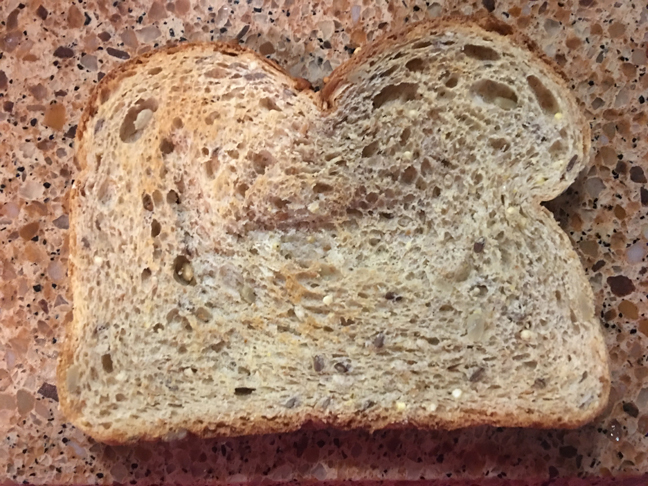 Here is my bread after the second toasting. Good thing the stamp only cost $3.00. My toasty, indented bread is not quite the memento I need to bring back memories of a June night in Paris on my 24th birthday. It doesn’t do justice to the Eiffel Tower light show I saw on a more recent visit either. 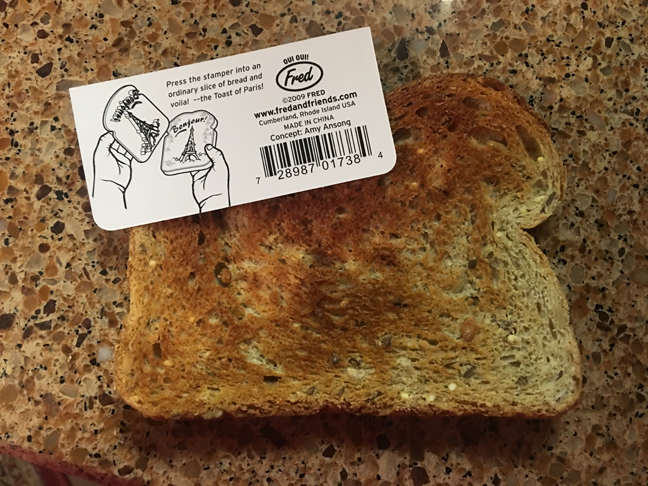 It’s just toast. What could be the problem? My toaster works and my bread wasn’t stale. So, I looked at the directions again and I may have found the alleged issue. Due to the distance, I’m thinking the translation got lost on the long trip from China to Paris. In conclusion, I just need to go back and eat some real French toast along the banks of the Seine. No souvenir required. 5 Responses to Did you get a Souvenir? Great post! I love the use of pictures. Thank you! Such a sweet comment! Ask your mother if she remembers our trip to Niagara Falls and your brother and cousin ate baby aspirin??? I certainly remember it. I can remember that trip, too! What drama we had rushing to the hospital!